$15 per person, includes lunch and workshop materials. Limited to 15 registrants to allow adequate hands-on exposure for participants. Hair sheep have been a growing segment of the U.S. sheep and small ruminant industry. They are well suited for sustainable, pasture-based production and are a good fit for novice producers. Over the past 15 years Virginia State University has been managing and conducting research with a hair sheep flock of different breeds. The animals are managed in a low input, easy-care production system that includes lambing on pasture at different times of the year (April, December and July). The day-long workshop introduces sheep producers to pasture lambing, and provides hands-on exposure to activities associated with lambing. The research flock at VSU consists of 100 Barbados Blackbelly and St. Croix ewes. Peak lambing activity is projected for the day of the workshop. For more information, contact the VSU Small Ruminants Program office at 804) 524-5960. REGISTRATION: $10 per person includes lunch. Dr. Whitley has worked with goats and sheep for 20 years at the University of Missouri, the University of Maryland Eastern Shore and North Carolina A&T State University. She earned her Ph.D. in animal physiology from Mississippi State University. Dr. Michelle Corley will discuss using stinging nettle for deworming. Dr. Eunice Ndegwa will discuss maintaining gut health in pre-weaned kids and lambs. Dr. O’Brien and Amanda Miller, VSU’s herd manager, will conduct hands-on sessions on vaccinations, proper drenching techniques, FAMACHA scoring, body condition scoring and maintaining hoof health. Goat and lamb products will be available for sampling. 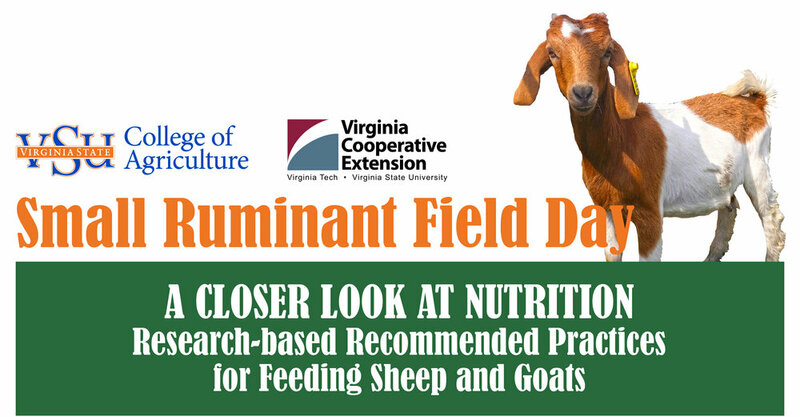 For information, contact the Small Ruminant Program office at (804) 524-5960 or email mklein@vsu.edu. If you are a person with a disability and desire any assistive devices, services or other accommodations to participate in this activity, please contact the Small Ruminant Program office at mklein@vsu.edu or call (804) 524-5960 / TDD (800) 828-1120 during business hours of 8 a.m. and 5 p.m. to discuss accommodations five days prior to the event. Payable to "DavidWise.com Insurance LLC" by check or cash upon arrival at the workshop. *includes lunch, refreshments and workshop materials. Sheep and goats can be raised to provide meat, milk, and fiber. They can also be raised for 4-H projects, clearing brush from an area or simply as pets. If you are interested in raising sheep and goats for meat, this class covers all the basics you need to start your enterprise. • Starting a farm business: insurance, tax, and legal considerations. • Everything you need to know to raise sheep and goats (breed selection, housing, supplies/equipment, fencing, feeding, marketing). • Health of your sheep and goats. • Reproduction (to include preparing for lambing and kidding). • Hands-on activities including hoof trimming, body condition scoring, correct drenching techniques, lambing, etc. If you are a person with a disability and desire any assistive devices, services or other accommodations to participate in this activity, please contact the Small Ruminant Program office at (804) 524-5960 / TDD (800) 828-1120 during business hours of 8 a.m. and 5 p.m. to discuss accommodations five days prior to the event. This all-day conference will focus entirely on gastro-intestinal parasites (worms) that are the most problematic to small ruminant production and seek to educate stakeholders on the most up-to-date methods and recommendations for controlling these parasites. The program will include general and concurrent sessions and a separate program for older youth (age 14 and up). All speakers in the adult program are members of the American Consortium for Small Ruminant Parasite Control (ACSRPC). They include Dr. Kwame Matthews, Delaware State University; Dr. Nelson Escobar, University of Maryland Eastern Shore; Susan Schoenian, University of Maryland; Dr. Dahlia O’Brien, Virginia State University; and Dr. Niki Whitley, Fort Valley State University. Youth instructors are Susan Garey and Dan Severson from the University of Delaware and Ashley Travis from the University of Maryland. The youth program is intended to be hands-on and interactive. To request special assistance due to a disability, please contact Dr. Kwame Matthews, at 302.857.6540 or kmatthews@desu.edu, by November 20, 2017. Join us for the Small Ruminant Field Day on Friday, October 20, beginning at 8:00am to learn more about the research-based practices for small ruminant nutrition. Cost is $10 per person, payable by cash or check on the day of the event. Please make your checks payable to "Virginia State University." Despite opportunities for success in sheep and goat production, parasite control and anthelmintic resistance are major problems faced by producers. This approved FAMACHA® training workshop emphasizes the use of multiple techniques, such as pasture management and strategic deworming, for the effective control of internal parasites. This is important to assist producers in prolonging the efficacy of chemical dewormers on their farms. This workshop is supported by the American Consortium for Small Ruminant Parasite Control, an organization that has developed research-based practices for controlling internal parasites on farms. With the exception of veterinarians and other qualified animal health professionals, you must take an approved training in order to get certified in the FAMACHA® system and receive a FAMACHA® card. Registration fee of $20 per person* should be paid upon arrival at the workshop by cash or check. *Includes lunch, notebook and FAMACHA card. Children 12 and under are free with an accompanying adult.